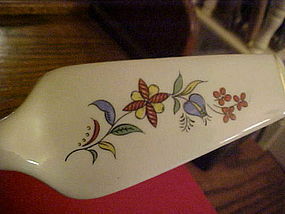 Vintage ceramic pie or dessert server measures 9 3/8" long. Made of glazed ceramic with an ivy pattern. No chips or damages. No makers mark. Oneida Community Tudor Silverplate oval soup spoon in the Queen Bess II flatware pattern. 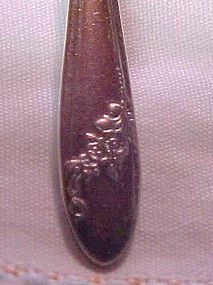 This listing is for a sugar spoon measuring 7 1/4" long, in very nice vintage condition. This Oneida Community flatware pattern was a premium that was obtained by collecting Betty Crocker coupons from the packages of various General Mills food products. 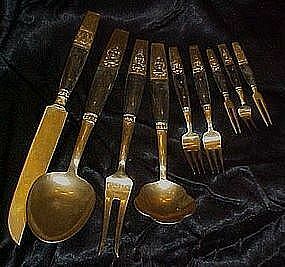 This was a very popular silverplate pattern from the 1940's and 1950's. It is discontinued and collected today through vintage and antique outlets. 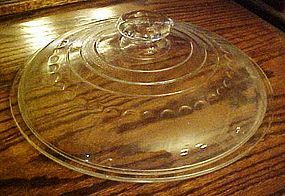 Griswold marked 12" glass lid octagon knob fits 10"
A Griswold glass lid for number 10 cast iron dutch oven. Octagon knob and embossed Griswold cross logo. Outside diameter is 12 inches, nesting diameter is 11-1/4 inches. Very nice condition, no chips or cracks. virtually no scratches or abrasions. 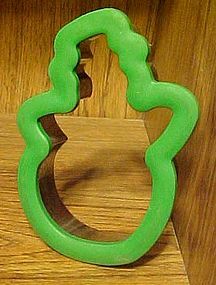 A really nice quality cookie cutter made of metal for precise cutting and a nice wide plastic edge in green plastic. I wish I know who made these, as they are vey nice. This snowman measures 5 1/4" tall. Nice 1 1/2" depth too. You could use them to cut out little tea cakes. I will be listing a Christmas tree cutter too. 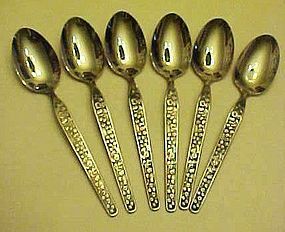 National Stainless spoons Sevita pattern, like new! 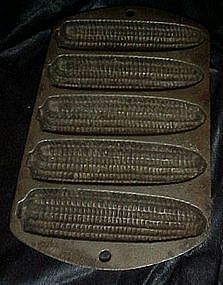 Smaller than most traditional corn bread pans, this has 5 ears of corn to pour your batter into. Makes yummy corn bread sticks. Measures 5 1/2" x 9" long. Nice condition and ready to bake in! Made of heavy cast iron. Nine assorted flatware serving pieces from Tailand. Made of solid brass with teakwood accents on handles. Siamese royalty head pattern. Consists of a large 10" spoon, A large 9 1/2" meat fork, an interesting 8 1/4" ladle, a 10" knife, (2) 6" forks with 3 tines, (2) 4" olive forks, and another 4 1/2" pickle fork. All pieces are in wonderful condition. Old unusual bottle opener with a can piercing tool on the end. Made in Tailand, it is made of brass with teak wood handle accents. Design of a Siamese royalty head. Measures 5 1/2" long and is in wonderful condition. Great to add to your can opener collection. Original boxed set of vintage cutlery by Parker and Sons Sheffield England. Comes in the original silk lined cutlery box it came with originally. Stainless steel blades with rich brown catlin bakelite handles. Consists of a carving knife, Fork, sharpener in the upper part and the 6 matching serrated steak knives in the drawer. This set is in brand new condition, and just beautiful! Storage chest has wear on the edges where it has been stored. You will love this classic set!